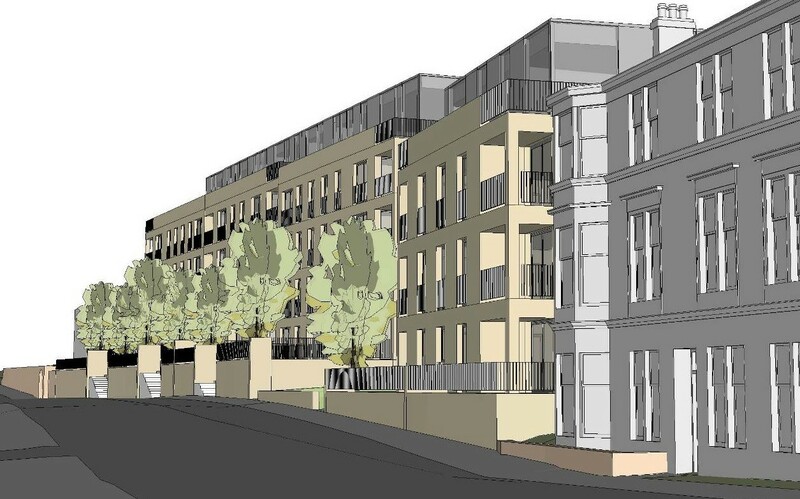 CALA Homes have submitted plans for 101 homes arranged over three blocks of up to five storeys at Mansionhouse Road, Glasgow. Penned by Macmon the project seeks to adopt a traditional ‘tenemental’ form with a setback façade of facing brick fronting a landscaped amenity space and existing stone retaining wall. A setback upper floor will be finished in fibre cement rainscreen panels. In their design statement the architects said: “The architectural design is conceived to promote ‘active’ facades, modelled with common entrances, balcony features and fenestration strongly defined. The grouping and rhythm of these features respect the bays and fenestration patterns on adjoining tenements. Common entrances will lead out onto a public footpath with DWA landscape architects coordinating the open space strategy. As a former resident of this street, it'll be sad to see those lovely trees go. Let's just hope CALA deliver something more in keeping with these lovely surroundings than their utterly unsuccessful shoebox development along the road. The development looks great and will be a good edition to the area. Massive improvement to the existing building. 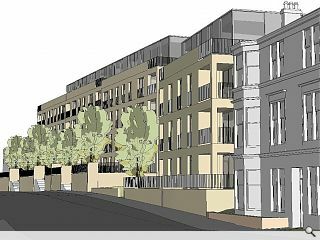 It looks like a modern take on the traditional tenements. Well done CALA! Good addition to the area, in terms of elevation they seem to be a good response to the context and a decent enough density for the area. However it is crucial that the materiality is of the highest quality, especially the stone facades and top floor which look as though it is glass and metal cladding? Also good to see large balconies and terraces. Can anyone remember what page of the 101 Things I Learned I Architecture School it said not to step back a street facade. Those front "gardens" will never be used and just detract from what could have at least made it feel contiguous in the street.